In the German-speaking world, the Habsburg Empire of the 19th century is also known as the "Donaumonarchie" or "Danube Monarchy". This shows how important the Danube is seen as a binding force between the various nations of the Empire. 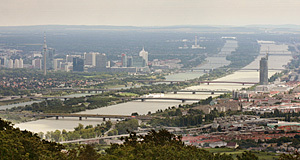 Today, the Danube is still by far the most important Austrian river, connecting the country′s heartlands Upper and Lower Austria as well as the capital Vienna. Therefore, I thought it is important to have a short article with a general introduction to the Danube in Austria here on TourMyCountry.com. The Danube is the second-largest river of Europe - 2,845 or 2,888 kilometres long, depending of your definition of the Danube springs. Either way, the Danube originates from the Schwarzwald (Black Forest) and runs to the Black Sea. Most creeks and rivers of Central Europe and South-East Europe contribute to the Danube. Back in the days of the Empire, Austria and its "crown lands" had a territorial claim on 1,800 kilometres of the Danube and the river offered crucial means of transportation. Today, the Austrian chunk of the Danube is significantly smaller, but the watersheds of Austria run in a way that almost all areas′ creeks run towards the Danube. The only exceptions are Vorarlberg (Rhine), a very small part of the North-Western Lower Austria and Northern Upper Austria (both Moldau). The Danube enters Austria just behind the Bavarian university city of Passau. 50 kilometres further downstream, one of Austria′s most famous parts of the Danube attract thousands of cycling tourists every year: The "Schlögener Schlinge" is a sharp curve that the Danube makes in the middle of picturesque landscape. The Danube changes its course by 180 degrees twice and the keeps running eastwards. The Upper Austrian capital of Linz follows after anther 20 kilometres, the Danube runs across it - Austria′s third-largest city and an important hub for industries and transportation. After Linz, the river Enns merges with the Danube near the city of the same name. Near Enns, you can also find the former concentration camp of Mauthausen with its notorious quarry that overlooked the Danube Valley. The deepest part of the Danube in Austria is at the merging point with the Grein River. Some 90 kilometres downstream of Linz, the town of Pöchlarn marks the nearing of the Wachau River Valley. The monastery of Melk is something like a shrine of Austria and sits on a cliff overlooking the Wachau - again a very popular area for cycling holidays. The Wachau is probably the prettiest part that the Austrian Danube runs through. It is approximately 35 kilometres long and links the towns of Melk, Dürnstein, Göttweig Abbey, Weissenkirchen, Spitz an der Donau, Aggstein and finally the Medieval city of Krems, the "official" end of the Wachau. The final 30-odd kilometres until the Danube reaches Vienna meet several pretty towns, including Tulln and Klosterneuburg. In Vienna, there are two important side-branches of the Donau, the Alte Donau and the Donaukanal; the main course of the Danube is divided by the Donauinsel, a 21 kilometre long artificial island. The Danube ports of Vienna are historically the most important ones - today, those of Beograd and Budapest rival Vienna in significance (or are actually ahead of Vienna). In the area of Vienna, the Donau is strictly trained to prevent damages from floods. Most of the training measures were applied after a disastrous flood in the early 1860ies. Upon leaving Vienna, the Danube passes the generally ugly "Industrieviertel" and Marchfeld plain of Vienna. The Industrieviertel has many factories, highways and transportation companies (alongside with Vienna′s airport Schwechat) and is very unappealing, but the Danube′s immediate surroundings are not only a dramatic wilderness, they are also strictly protected - as the "National Park Donauauen" between Lobau on the edge of Vienna, Fischamend and Hainburg. The nearby town of Carnuntum (once the capital of a Roman province) provides evidence for the importance of the Danube as a natural border. A plateau outside of Hainburg provides an ideal look-out to watch the Danube leave Austria and run towards Bratislava in Slovakia. There is a boat line that connects the two cities of Vienna and Bratislava; cruises are also popular near Linz (with the city itself having important industrial ports) and between the Wachau and Vienna as well as in the Wachau itself. The Danube is not only recreational ground, transport line and tourist attraction - it is also used by the energy industries. In Austria alone there are 11 water-driven power plants with plans for several more. The "International Commission for the Protection of the Danube" is part of the UN and has its headquarter in Vienna - by the shores of the Danube. back to "vienna travel guide" or "background"